The Artist's Touch, the Craftsman's Hand presents a selection of the most historically important and visually compelling Japanese prints from a collection of more than 2,500 works spanning the late 17th century to the present day. Many are extremely rare and almost all appear here in an English-language publication for the first time. Noteworthy areas of interest include early actor prints, dating back to the first decade of the 18th century; works by Suzuki Harunobu, the master associated with the origins of full-color printing in 1765; the deluxe, privately printed surimono of the early 19th century; painterly landscapes of the early 20th century, including a series that documents the Great Kanto Earthquake of 1923; and contemporary prints, ranging from Op Art and Abstract Expressionism to lyrical evocations of an imagined past. 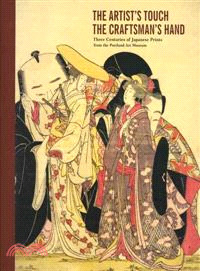 Essays include an overview of the illustrated works and articles on Harunobu, prints of kabuki actors and their fans, and the cultural meanings in still-life surimono. Maribeth Graybill is the Arlene and Harold Schnitzer Curator of Asian Art at the Portland Art Museum, Oregon. Other contributors are John T. Carpenter, Donald Jenkins, Lynn Katsumoto, and Laurence R. Kominz.